A Confederate monument located outside the NC Capitol. Dedicated on May 20, 1895. The shooting of nine African-Americans earlier this month has prompted national debate over whether the Confederate battle flag should continue to fly at the South Carolina Capitol. Gov. Nikki Haley called for the flag to be taken down while President Obama said it "represented more than just ancestral pride" during the eulogy of Rev. Clementa Pinckney Friday. Host Frank Stasio talks with Lori Martin, professor of sociology at Louisiana State University, Kerry Haynie, professor of political science and African and African American studies at Duke, and Al Brophy, professor of law at UNC. He also heard from Fitz Brundage, history professor at UNC-Chapel Hill, and Steve Quick, writer for Southern Heritage News and Views. "The state has no business being in the business of flying a flag and symbols that have meant exclusion and discrimination and racism," said Kerry Haynie, professor of political science and African and African American studies at Duke. 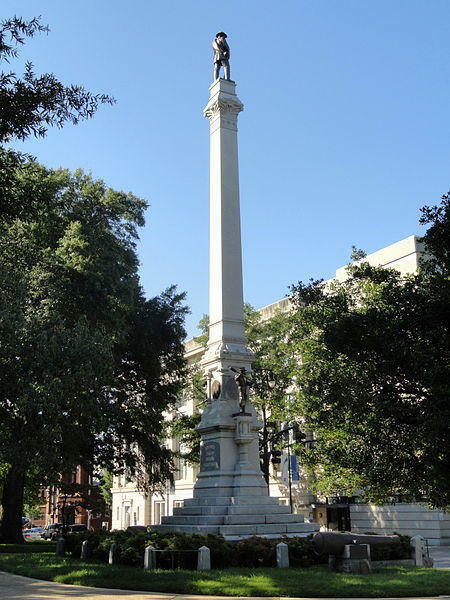 Meanwhile, a 75-foot monument has commemorated fallen Confederate soldiers at the North Carolina Capitol since 1895. It is one of dozens of monuments scattered across the state commemorating Confederate soldiers. North Carolina has more monuments commemorating the Civil War than any other event, according to "Commemorating Landscapes of North Carolina," a project conducted by UNC-Chapel Hill Libraries. More than half of North Carolina's counties have dedicated at least one memorial to Confederate soldiers. An interactive timeline shows most Confederate monuments in the state were erected between 1890 and 1930. UNC-Chapel Hill History Professor Fitz Brundage helped map North Carolina's monuments. He said the Confederate battle flag was revived in the 20th century as a symbol of the Confederacy and the "white South." However, he said Confederate monuments hold a different meaning from the flag. "The act of flying a flag is inherently an act of honoring whatever that flag represents," Brundage said. "A monument is where my leanings as a historian kick in, and I would hate to see monuments destroyed. They are historical artifacts that can tell us things and we can use them to think about the past and our relationship to it." 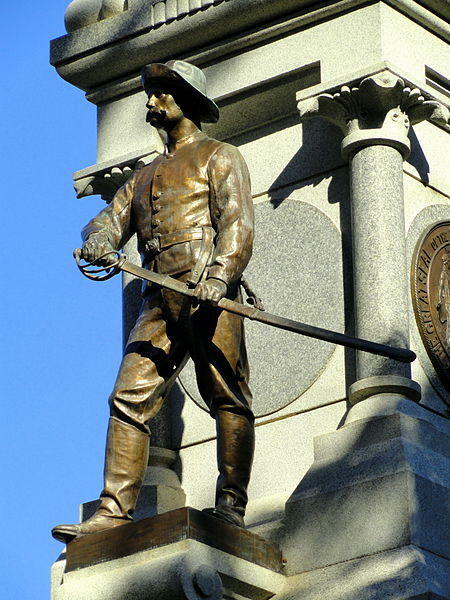 Brundage said there are about five Civil War monuments to every World War I monument in North Carolina. UNC-Chapel Hill Libraries also provides an interactive map below of monuments and landmarks in Raleigh and Chapel Hill. Lori Martin, professor of sociology at Louisiana State University, said Confederate flags and monuments glorify a racist legacy of white superiority and black inferiority. "There is no real way to separate that myth from these various symbols," Martin said. "We also need to think about who are we not honoring, right? So we are not looking at the people who fought to uphold the rights that we claim to hold so dear, and we are not taking into account the people that do not have the privilege of knowing who their ancestors were because they were stripped from their homelands." 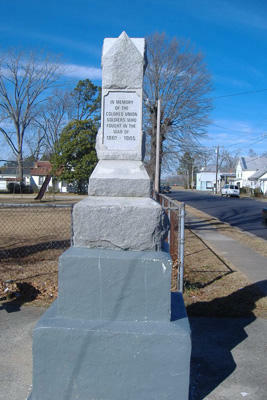 A 'Colored Union Soldiers' monument in Perquimans County. Martin applauds communities that are memorializing more diverse voices with historic markers and moving away from honoring historic figures who may have promoted the beliefs of the Confederacy. However, Steve Quick, writer for the Southern Heritage News & Views, said people are being too sensitive about Confederate symbols. "There are a number of things that a lot of us feel are offensive. The problem is we have been overly sensitized in this country to every real or imagined grievance," he said. 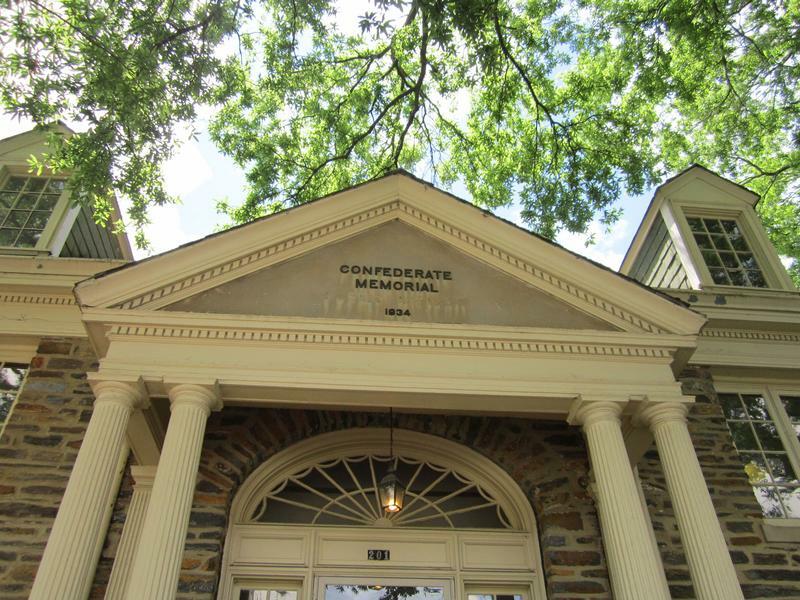 Recently, students at UNC-Chapel Hill successfully campaigned to have a campus building renamed. In 1920, the building was named after William L. Saunders, a UNC alumnus with ties to North Carolina's Ku Klux Klan. Fewer than ten Civil War monuments in the state honor Union soldiers, according to UNC-Chapel Hill Libraries. Only one monument in Perquimans County honors black Union soldiers, and it does not feature a a statue of a soldier. Another memorial recognizes Union County's "Confederate Pensioners of Color." Haynie said there is a difference between buildings named after white supremacists and Civil War monuments outside the State Capitol. "We can't erase the fact that North Carolina was a part of the Confederacy," he said. "I think it is important for us to see that as present-day citizens." Confederate License Plates: Who Has The Authority To Stop Production? Two of the most powerful officials in the state are pointing fingers at each other in a dispute over who has the authority to stop the production of Confederate license plates. Governor Pat McCrory and Senate Pro Tem Phil Berger claim to lack the authority to mandate that the DMV to no longer issue the controversial plates. In the wake of the mass shooting last week in South Carolina, Governor Pat McCrory has joined a growing number of Southern governors who are moving toward abolishing the Confederate battle flag from things like government buildings and here in North Carolina--license plates. Hillsborough is one of the oldest towns in the state with a strong legacy tied to the Civil War. The town is now faced with questions about its historical Confederate markings and what is appropriate going forward.